Last year, I was travelling home from work, reading the Metro, and I noticed an advert that actually made me giggle. It was for a show on Dave called Modern Life is Goodish and, since the marketing had caught my attention, I thought I'd give it a whirl. 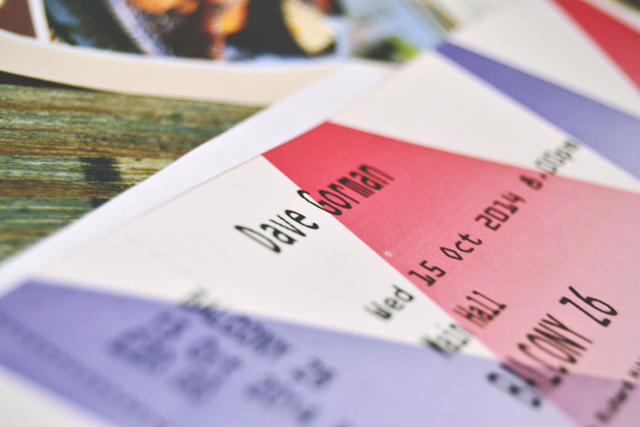 As it turned out, the show was absolutely hilarious and Dave Gorman quickly became my favourite comedian so when we realised he was performing nearby, we snapped up tickets. Although we'd only been able to get seats in the back row of the balcony, we had a great view that was totally unobstructed by the people in front of us. 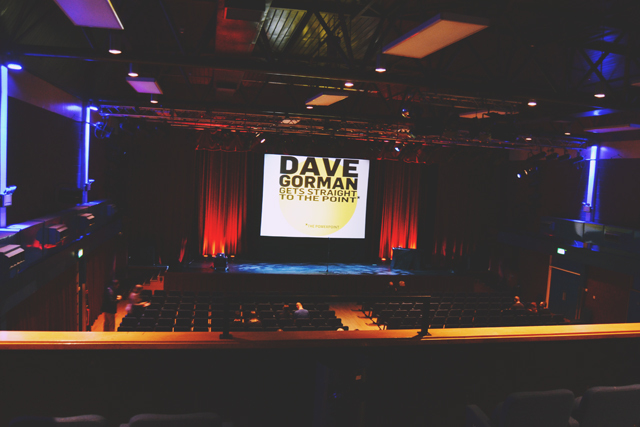 As Dave Gorman's show is Powerpoint-based (I swear, it's funnier than it sounds! ), the huge screen at the back of the stage makes it easy for everybody to see. The show began with an introduction personalised to each venue. Dave had researched the town to find notable residents and created a short slideshow based around these before introducing his warm up act Nick Doody who had an edgy, intelligent style of humour which, while very funny at times, I also found waned occasionally with some long, awkward silences. Dave Gorman himself entered the stage with his usual punchy, almost sassy style. There was no self-indulgent walk onstage to the sound of rousing applause. Instead, he distracted us all with a slide and then pop! There he was. Despite this rather immature- but hilarious- approach to his comedy, Dave offsets this with a subtlety and sophistication that requires some element of mathematical knowledge, technical know-how and wry observational skills without taking himself too seriously. Without a doubt, the highlight of the show for me was Dave's performances of two Found Poems, compiled from the outraged comments from the bottom of news stories, one of which was complete with backing piano by Nick Doody. The interaction between the two comedians on stage was fantastic, and they clearly have an excellent relationship. It was a wonderful evening- absolutely hilarious and uplifting. 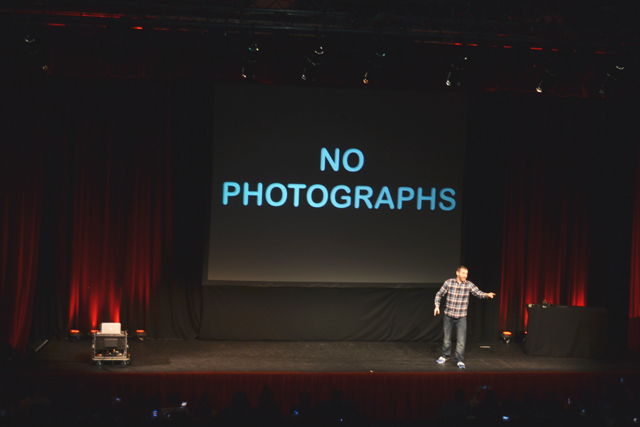 If you get a chance to see Dave Gorman Gets Straight to the Point, I recommend it. Otherwise, have a watch of Modern Life is Goodish on Dave every Tuesday. I promise you'll love it! This is a reminder that I need to watch more of his things. The only show of his I've actually seen is that one where people come up with inventions or ideas they've had and I thought it was hilarious, and a brief read of Are You Dave Gorman? in someone's bathroom! Definitely need to look up some more. Glad you had fun! I really recommend Modern Life is Goodish. It has me in stitches every week! Definitely see him live when you get the chance! We are seeing this in Sheffield in December and I am so excited. I think he is awesome! I've heard a lot about Dave Gorman but never watched anything of his as I thought I wouldn't like it. You've inspired me to investigate now though as he sounds quite similar to James Ward (http://iamjamesward.com/) and I love his blog. I haven't heard of James Ward, so I'll check him out now. You say his japes are harmless but I was very invested in the rush hour crush story he did on the episode the other day and was pretty sad to find out that the third guy was a lie! on the other hand, the txt he showed from the metro was mine and i was so excited to be on a powerpoint I phoned my mum. Oh no! Still awesome that your tweet was on the show though! We have it on series link too. Love him!